10 posts categorized "Modern history"
Along the road from the oil-rich multi-ethnic Iraqi city of Kirkuk towards the modern cosmopolitan Kurdish city of Sulaymaniyah, there sits a rather large boulder. For the most part this boulder is unremarkable, probably shaken from the mountain above it by an earthquake in times past. Yet, to the inhabitants of Iraqi Kurdistan this boulder has become a symbol of the injustices they have faced in the 20th century and their on-going struggle for Kurdish self-governance and independence. The Kurds of Iraq have nicknamed the boulder “Barda Qaraman” or the “The Hero’s Rock”. It was behind this boulder, at the end of the First World War, that the leader of the first Kurdish nationalist uprising, Sheikh Mahmud Barzanji, personally took on the British Empire in the name of Kurdish statehood. This is the untold story of the first Kurdish rebellion by the self-proclaimed ‘King of Kurdistan’ against British rule as preserved within the India Office Records at the British Library. As the grip of the Ottoman Empire eased at the end of the First World War the British found it difficult to establish control over the rugged and mountainous terrain of the Kurdish provinces of the old Empire that now became into their sphere of influence. The Kurdish people are often quoted saying they “have no friends but the mountains” and for the early years of engagement with the British the mountains served them well. The lack of a railway line into Kurdistan and the inhospitable terrain made communication and the movement of troops difficult. Moreover, mounting economic pressure on the British treasury to reduce spending on imperial projects meant the need for a railway in Kurdistan was never met. This allowed the Kurds a much needed political space to contemplate their post-war future. At the end of the First World War, the Kurds had initially asked for British rule and protection on account of their impoverished state. Previous Turkish and Russian rule had left many villages desolate and in a state of famine. Needing to remedy their inability to hold Kurdistan the British agreed to Kurdish requests and installed a colonial system of indirect rule. They worked to reinforce Kurdistan’s feudal and tribal structures by giving tribal elders the ability to feed their people, and rebuild their villages. 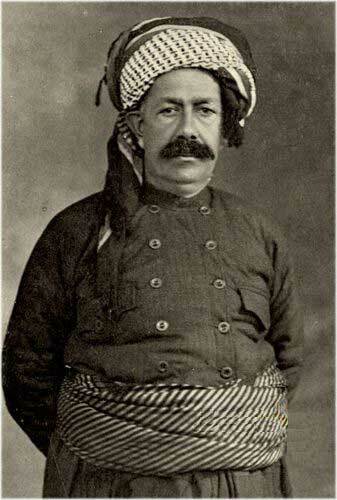 To have some semblance of control the British also decided to appoint a local Kurdish notable Sheikh Mahmud Barzanji as governor of lower Kurdistan in 1918 to act as their regional representative. To support Sheikh Mahmud’s governance and in some part to pacify his known rebellious nature, British officials travelled to the west and north of Sulaymaniyah to garner support for the new system of British rule. They replaced Arab and Turkish officials with Kurdish ones, in effect giving the Kurds their first taste of self-rule. Unfortunately, he is a mere child as regards intellect and breadth of view, but a child possessed by considerable cunning and undoubtedly inspired by an inordinate ambition. Moreover, he was surrounded by a class of sycophants who filled his head with extravagant and silly notions, leading him to style himself ruler of all Kurdistan and encouraging him to interfere in affairs far beyond the borders of the sphere allotted to him. Realising that giving Sheikh Mahmud more power and broadening his rule could be dangerous the British decided to restrict his authority. They prevented the incorporation of the Iraqi towns of Kifri and Kirkuk into his jurisdiction and removed the powerful Jaff tribe from under his rule, deciding instead to deal with them directly. This influenced other tribes to seek direct contact with the British and thus support for Sheikh Mahmud quickly waned retracting his zone of influence to the immediate vicinity of Sulaymaniyah city. Responding to this challenge and in an attempt to force the creation of separate southern Kurdistan under his rule he rebelled against the British on 22nd May 1919. With the support of a tribal coalition of men and horses Sheikh Mahmud defeated a small group of Kurdish levies and imprisoned the British officers and their staff in their houses in the city of Sulaymaniyah. He then appointed his own mayor, seized the government archives and money from the treasury. He also cut the telegraph-line between Sulaymaniyah and Kirkuk, essentially annexing southern Kurdistan from British rule. The next day a British aerial reconnaissance of the area in revolt noted that the city of Sulaymaniyah was filled with armed men. What is more, the imprisoned British officers made themselves known to the aviators by signalling to them from their houses. After rounds of heavy RAF bombing and machine-gunning of Sulaymaniyah city and the surrounding villages, Sheikh Mahmud’s rebellion was forced out of the city towards the surrounding hills and valleys. According to accounts, it quickly became clear that Sheikh Mahmud’s Kurdish forces were by and large ill-prepared to face trained soldiers on the battlefield let alone a sustained RAF air bombardment that resulting in heavy casualties and the gutting of entire villages and neighbourhoods. With the Sheikh’s ammunition supplies running low many of his allies began to lose faith, some switching sides as the battle went on. The rebellion culminated in the standoff at the ‘Bazian Pass’. The ‘Bazian Pass’ is a gap between the Sulaymaniyah valleys and the Garmian plains, that is hemmed in by mountains. In the hope of stopping the British advance Sheikh Mahmud’s forces constructed a stone wall across the pass. However, a British pilot spotted that the wall was not effectively constructed and on the 8th of June 1919 pilots bombed the pass and its surrounding areas weakening the defences and hitting Sheikh Mahmud’s troops hard. This was followed on the 18th of June by a further attack which brought down the wall. Sheikh Mahmud’s men were then easily routed. Some were killed, but the majority were wounded and imprisoned. Sheikh Mahmud himself was found injured taking cover behind the large boulder on the east of the pass. Once they had control of the pass the British quickly returned to Sulaymaniyah and disarmed the local population freeing the imprisoned British officers. Sheikh Mahmud himself was tried, and imprisoned in India only to be released a few years later. The majority of the reports in the file are written by Lieutenant-Colonel Harold Richard Patrick Dickson (1881-1959), who served as Britain’s Political Agent in Kuwait from 1929 until 1936. Dickson continued living in Kuwait after serving as Political Agent (a role he held again temporarily in 1941) and stayed in the country until his death in 1959. During this time, Dickson wrote two books about Kuwait and the surrounding area, the encyclopaedic – if shamelessly Orientalist – work The Arab of the Desert: a Glimpse into Badawin [Bedouin] Life in Kuwait and Sau'di Arabia (George Allen & Unwin, 1949) and the later Kuwait & Her Neighbours (George Allen & Unwin, 1956) that was edited by the writer Clifford Witting. Both books, notably the former, reveal Dickson’s near obsessive interest in the minutiae of the history, culture and everyday life of the people of Kuwait and Gulf region, with a particular interest in the customs and traditions of the Bedouin. Dickson’s wife, Violet Dickson (1896-1991), commonly known as Umm Saud (Mother of Saud) in Kuwait, shared many of her husband’s interests and also wrote about Kuwait, authoring both The Wild Flowers of Kuwait and Bahrain (George Allen & Unwin, 1955) and Forty Years in Kuwait (George Allen & Unwin, 1971). She stayed in the country after Dickson’s death, living in the couple’s long-term residence (that formerly served as Britain’s Political Agency) for many decades until she was forced to leave due to the Iraqi invasion of 1990. The building is now open to the public as the Dickson House Cultural Centre in Kuwait City. The couple’s daughter, Zahra Freeth (1925-2015), also wrote a number of books on Kuwait including Kuwait Was My Home (George Allen & Unwin, 1956) and A New Look at Kuwait (George Allen & Unwin, 1972). The reports written by Dickson in 1933 contain a diverse range of detailed information including descriptions of car routes between Kuwait and various other settlements in the region (including Basrah, Riyadh, Hasa and Qatif), insightful and frequently scathing character assessments of prominent figures in the country, as well as sketches of the different types of boat used in the country and lists of the species of fish in its waters. It is likely that the information contained in these notes was used by Dickson at a later date to compile his published works. For instance, The Arab of the Desert contains drawings of the different types of sailing vessel in Kuwait that are very similar to the aforementioned sketches contained in Dickson’s notes from almost two decades before. In addition to Dickson’s reports, the recently digitised file contains a secret report on Kuwait that the Australian explorer, Alan Villiers – author of the well-known study of Arab sailors, Sons of Sinbad – was commissioned by the British authorities to write in 1939 (folios 160-183). The file also contains reports written by two of Dickson’s successors as Political Agent in Kuwait in the 1940s, Major Tom Hickinbotham (folios 187-198) and Major Maurice O’Connor Tandy (folios 226-228) as well as a Who’s Who of the leading personalities in Muscat (Oman) written by Captain J B Howes, the Political Agent in Muscat in 1942 (folios 199-209).